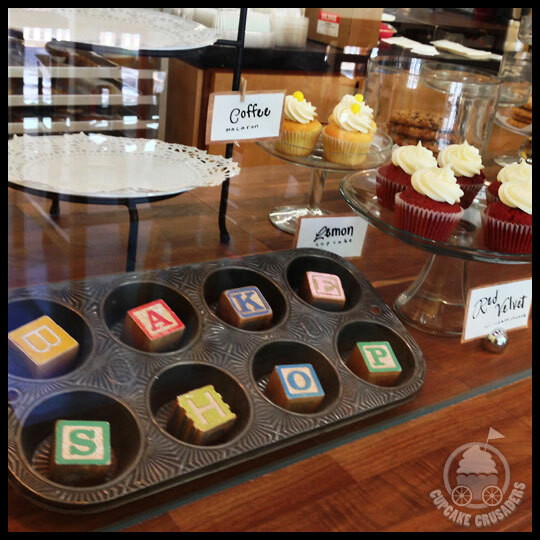 With the large, bold “Bakeshop” type on the storefront windows , there is no confusion on what you will find behind them. Once inside, you will see that Bakeshop is a blend of modern, classic, and quirky with a display of mismatched dessert stands showcasing Parisian macarons, cookies, and pretty little cupcakes. After exploring their website and Facebook page, I knew I would be getting some macarons along with my cupcakes, but I was also interested in something they call “Oreo in a Blanket.” If you think an Oreo cookie can’t get any better, think again. Bakeshop has baked an Oreo inside of a chocolate chip cookie, which I can only imagine tastes like heaven. Unfortunately, I didn’t end up leaving with my entire wish list, because at $2.75 each, the Oreo in a Blanket cost more than their cupcakes or macarons, so I had to pass. Crusader Jenn was with me and we decided to take three cupcakes and three macarons home with us. I selected a Lemon cupcake, a Lemon macaron, and a Peaches N Cream macaron. 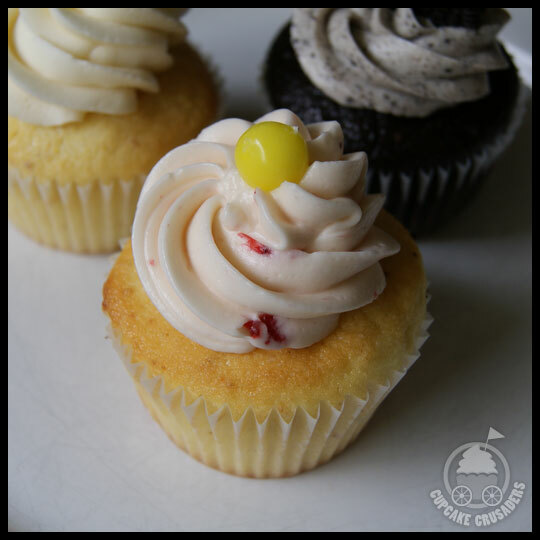 Jenn decided to stay in the car with her sleeping daughter, Leah, and asked that I pick out two cupcakes and one macaron for her, so I chose a Cookies N Cream cupcake, a Strawberry Lemonade cupcake, and a Salted Peanut macaron. The frosting on this Lemon cupcake didn’t seem to have much (if any) lemon flavor to it, but it was smooth, light, and creamy. While the cake had more flavor, it seemed like there was an extra flavor in there which reminded me of a lemon poppyseed muffin. The cake was far from muffin-like though with its moist, fluffly, and light texture. Even though this cupcake didn’t have the burst of fresh citrus flavor I prefer in a Lemon cupcake, it was still really tasty. Crusader Jenn said that this cupcake was moist and light, but it had a bit of a weird flavor that tasted more like candy than fresh fruit. Even though you can see the strawberries in the frosting she said she couldn’t taste it at all. I think macarons accompany cupcakes in a great way. Small and packed with flavor, if a bakery or coffee shop sells them, I will almost always buy one or two. I’m still not an expert on macarons, but these were $2 a piece which I think is about the normal average cost of one. The outer shell of the cookie was not quite as smooth as I’m normally used to seeing, but that didn’t stop me from diving it. I thought the Peaches N Cream really could have used more flavor, but the lemon one was great. 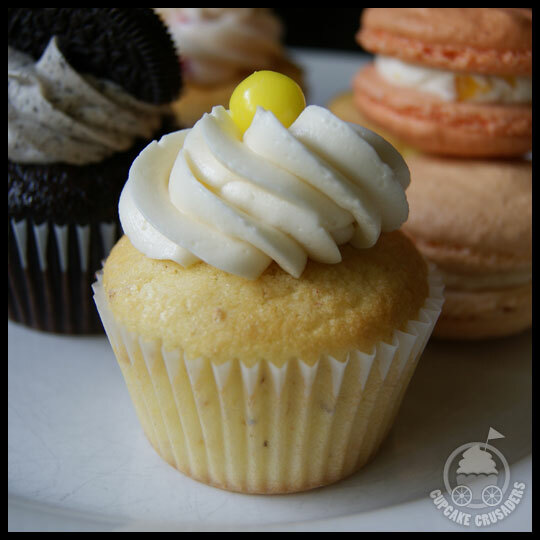 It had a more true lemon flavor than the cupcake from Bakeshop, so it was a happy surprise. Jenn said that the Salted Peanut macaron was the best of all three treats she tried from Bakeshop because it had lots of rich flavor that was a good balance of sweet and salty. She felt like it might have been a little more airy than she’s had in the past (I thought the same about mine), but that since it had a nice crunchy outside and was soft and moist on the inside it was still really enjoyable. 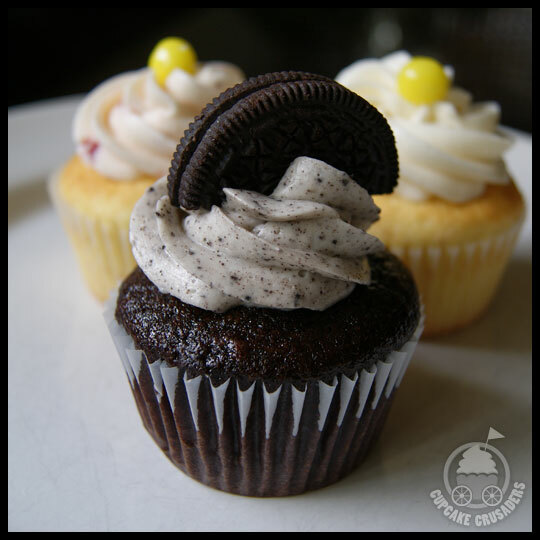 Bakeshop’s cupcakes are on the small side, but priced well at only $2 each. If I ever find myself in their neighborhood again, I would definitely stop in to get some macarons. I might even grab a new cupcake flavor or two (at only $2 each, how could I say “no?”). 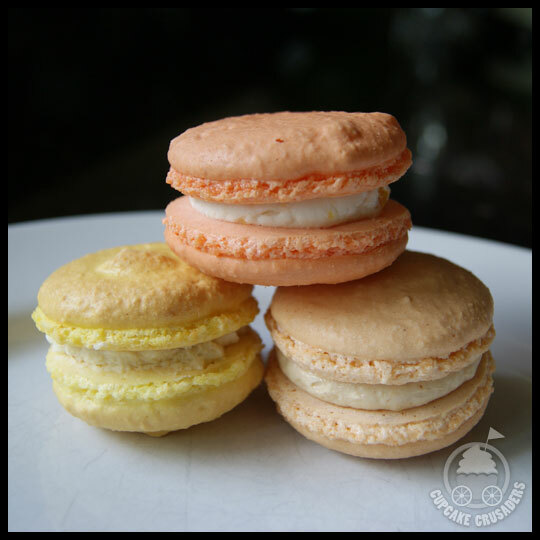 This entry was posted in Cupcakes, Macarons, Virginia and tagged Arlington, Bakeshop, Bakeshop Virginia, cookies 'n cream, Cupcake, DC area, french macarons, lemon, macaron, strawberry Lemonade, Virginia by Stacy. Bookmark the permalink. Oh too bad that strawberry one was disappointing. It looked so good.